Real-time, in situ monitoring of the self-assembly of nanocrystal structures has been made possible by a team of researchers using a combination of technologies, including controlled solvent evaporation and synchrotron X-ray scattering, paving the way for researchers to gain insights into the mechanisms behind the self-assembly of these structures. The research team, including William A. Tisdale and grad student Mark C. Weidman, both at MIT’s Department of Chemical Engineering, and Detlef-M. Smilgies at the Cornell High Energy Synchrotron Source (CHESS), have described their findings in a paper published in the Nature Materials journal. Researchers have been intrigued for decades by the conversion of simple colloidal particles suspended in a solution into closely packed, aesthetically pleasing lace-like meshes, or superlattices. These small superlattices, also known as quantum dots, have been used in the fabrication of more vivid display screens and a number of optical sensory devices. The ability of quantum dots to transform any form of the surfaces into smart screens or energy source hinges is the driving factor to understand their formation. The researchers believe that the study results will open the door to directly manipulate such superlattices, with the potential of on-demand fabrication and the possibility to create principles for the fabrication of associated soft materials such as polymers and proteins. 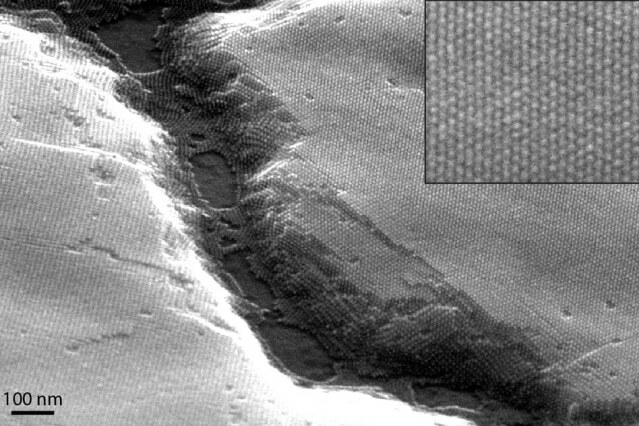 Many research groups, including Tisdale and his colleagues, have been showing interest to explore hard semiconductor nanocrystals with surfaces consisting of organic molecule coating. Such solution-processable electronic materials are available under various names and part of various devices from televisions to lighting displays. They are also considered as a potential candidate for producing efficient energy conversion devices such as solar cells owing to their low-cost manufacturing processes and ease of fabrication. However, the self-assembling mechanism of these nanocrystals that transforms them from colloidal particles, which are in the form of small Styrofoam balls dispersed in a liquid, to superlattices is still a mystery, limiting their widespread adoption in other energy conversion technologies. Some of the characteristics of the initial colloidal state and the final superlattice structure have been revealed by techniques such as dynamic light scattering and electron microscopy. However, the transformation between the two states has not been clearly defined by the existing techniques. Initial research on this topic dates back to the mid-1990s with MIT’s Moungi Bawendi’s group. In the past 10 to 15 years, a lot of progress has been made in making very beautiful nanocrystal structures. However, there’s still a lot of debate about why they assemble into each configuration. Is it ligand entropy or the faceting of the nanocrystals? The depth of information provided by watching the entire self-organization process unfold in real time can help answer these questions. Mark Weidman, Tisdale’s graduate student and co-author, used a Cornell-built experimental chamber and a newly developed dual detector setup featuring two fast area detectors to take the nanoscale movie by changing the environmental conditions for superlattice formation. Weidman simultaneously carried out small-angle X-ray scattering observation to capture the superlattice structure, and wide-angle X-ray scattering observation to obtain information about atomic scale orientation and single particle alignment, using lead sulfide nanocrystals while the solvent is being evaporated. We believe this was the first experiment that has allowed us to watch in real time and in a native environment how self-assembly occurs. These experiments would not have been possible without the experimental capabilities developed by Detlef and the CHESS team. Data can be collected at a much faster rate using heavy element (lead) nanocrystals and the brightness of the synchrotron X-ray source, enabling real-time monitoring of the self-assembly and producing in-depth images and movies of the process. The discovery may help to develop refined models for self-assembly for a variety of organic soft materials. The capability of real-time monitoring the evolution of the structure helps to intervene or direct the system into required configurations, providing a guide to create superlattices. However, more research is required to fully understand the self-assembling mechanism of nanocrystals, said Tisdale. Going forward, he and his colleagues will use their method to manipulate parameters, such as nanocrystal size and shape and solvent conditions, and to explore the ligands on the surface closely, as they appear to be the key factor for self-assembly. We hope that this study and technique will help to increase our understanding of colloidal self-assembly and, in the long term, enable us to direct nanoscale self-assembly toward a desired structure. The work received support as part of the Center for Excitonics, an Energy Frontier Research Center funded by the U.S. Department of Energy Office of Basic Energy Sciences. The National Science Foundation and the National Institutes of Health/National Institute of General Medical Sciences supports the Cornell High Energy Synchrotron Source (CHESS).